Zombies consider unionising for games industry. Bend Studio is developing PlayStation 4 exclusive Days Gone, Sony announced at its E3 2016 press conference. 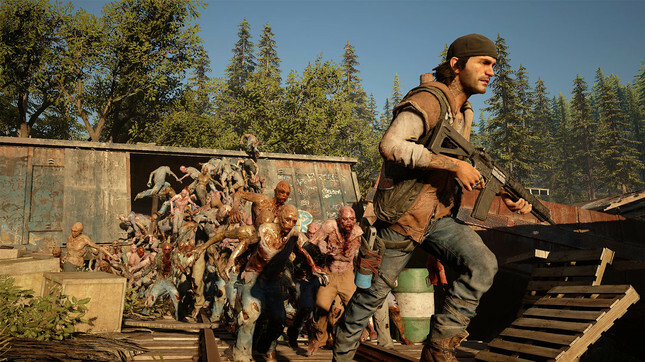 Days Gone is an open-world action adventure game set in the Pacific Northwest region of the USA, two years after a global pandemic has wiped out the majority of the population and turned others into feral creatures called Freakers (read: zombies). Players will control protagonist Deacon St. John, a drifter, motorcyclist, and bounty hunter. Sony’s E3 presentation was bookended by Days Gone, opening with a reveal trailer and wrapping up with gameplay footage. "This is a brutal world, where everyone and everything is struggling to survive – but hopefully, the trailer shows that the game is about more than that. "It’s about desperation, hope, transformation, loss, madness, discovery, friendship, exploration, brotherhood, regret and love. In the end, Days Gone is about what makes us human." Bend's last release was the PS Vita card game Uncharted: Fight For Fortune in 2012. A release date for Days Gone is yet to be announced. A shambling mob of clichés.